Support your loved one on every Breast Cancer Awareness Walk with your Personalized Walk To Defeat Breast Cancer Breast Cancer Shirts. Each Personalized Tee Shirt proudly displays who you are walking for with loving compassion. The hot pink color will make a bold statement as you wear this shirt around town. The shirts were a hit with the team. I wish I had ordered them a week earlier to benefit from the discounts, but I know this is a business. I guess even with the $5 hike it was worth it. Great delivery. We all loved the shirts.They are great quality and were printed just as ordered.Next year I will use your company again! The t-shirts I ordered fit perfectly and are correctly customized. This was very easy to do. Thanks. 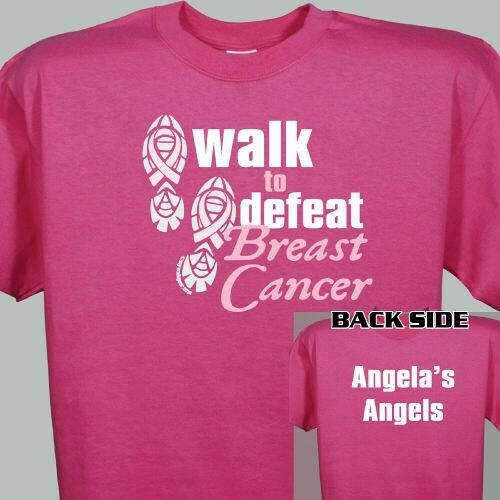 MyWalkGear.com has many additional Personalized Breast Cancer Walk Gear for your special gift giving needs. Each time a gift is purchased from our Breast Cancer Awareness line of personalized gifts, MyWalkGear.com will donate a portion of the proceeds to help in the fight against breast cancer.You may also like to view our Walk to Defeat Breast Cancer Water Bottle and our Walk to Defeat Breast Cancer Key Chain.